Available for UK next day delivery with FREE Chocs! The bouquet presents haunting brassicas with ghoulish blood germini flowers, Mango roses with a pumpkin pick, creepy widow spider framed with bone like birch twigs. A trick of a bouquet with a treat from us, a free box of Belgian Chocolates! 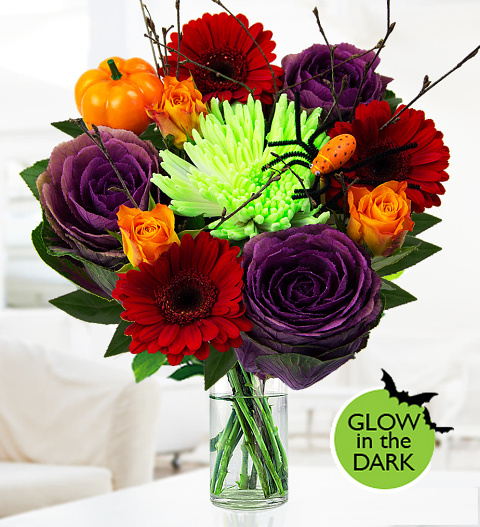 Perfect for Halloween this year, this bouquet is spectacular during the day, but at night it has a special trick! The white chrysanthemum is specially coated that once it has absorbed the day light will glow at night time! Chocolates may contain nuts.